Best Choice Products is proud to present this brand new Folding Exercise Bike. This new exercise bike will provide you with a total body workout that is designed for a low-impact cardiovascular workout. The bike is made with a sturdy steel frame design that delivers the maximum resistance. It includes a built-in digital display that will track your calories burned, distance, speed and time. 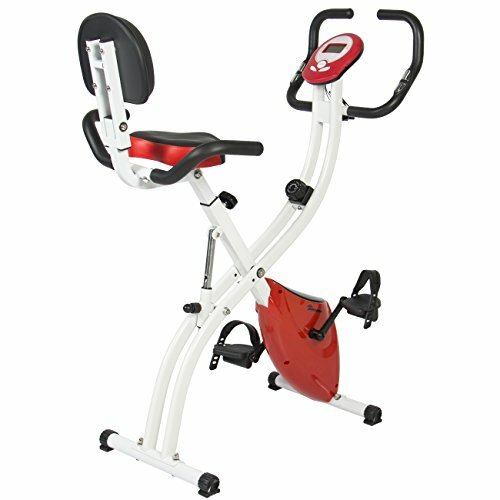 Our folding adjustable exercise bike provides an enjoyable total body workout as well as a comfortable exercising environment. The workout intensity on this bike will make sure that you will always get a good calorie burning experience. You can exercise at anytime and anywhere with exercise bike at the comfort of your own home. We purchase our products directly from the manufacturer, so you know you’re getting the best prices available. NEW PRODUCT WITH FACTORY PACKAGING. SPECIFICATIONS: Overall dimensions: 26″(L) x 21″(W) x 50″(H), Weight Capacity: 220lbs., Weight: 40.35 lbs. PLEASE NOTE: Our digital images are as accurate as possible. However, different monitors may cause colors to vary slightly. Some of our items are handcrafted and/or hand finished. Color can vary and slight imperfections in the metal work are normal and considered evidence of the hand-finishing process, which adds character and authenticity to those items.